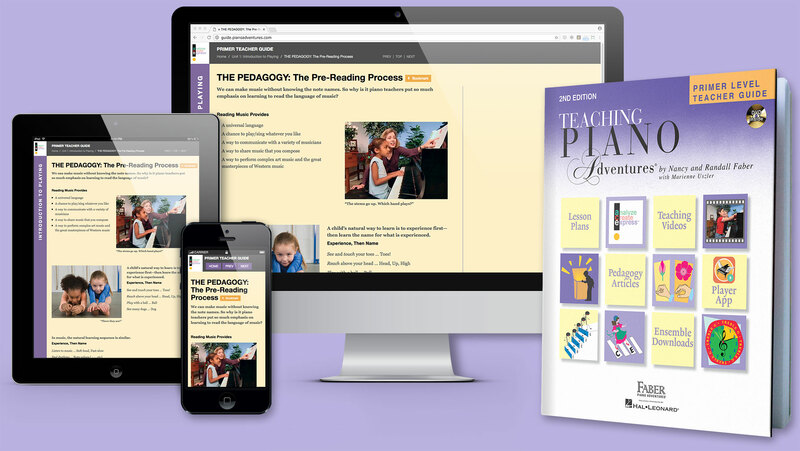 The new Piano Adventures® Primer Level Teacher Guide by Nancy and Randall Faber provides comprehensive support. Take it with you in print, or access online from any device! Teach all the core books: Lesson, Technique & Artistry, Theory, Performance, and Sightreading. 20 new articles present core pedagogical principles and philosophy. Download student parts for 20 Lesson Book pieces. Includes stories for group lessons and recitals! Watch Nancy Faber teach every Primer Level piece with her students. Over 60 videos! ”Ask yourself” questions for enrichment in self-study or classroom use. Extra accompaniments for lessons, rhythmic support, and creative exploration. Check out the Table of Contents and browse sample pages, videos, and duets!